A little over a month ago, Samsung unveiled its new Gear S smartwatch, a Tizen-powered timepiece capable of making calls and going online without leaning on a smartphone. Heck, it even promised full turn-by-turn navigation provided by the Nokia-owned HERE mapping platform. But what about an internet browser? Nada. Until now, that is. Opera Mini, the mobile-focused incarnation of perennially popular Web browser Opera, is being made available for the Samsung Gear S, making it the first browser available on the device. Granted, perusing the Web on your wrist may not intuitively seem like the greatest of experiences, but Opera says it has worked to make its browser play nice on the timepiece. For example, Web shortcuts from the Speed Dialer appear as ‘large’ buttons. To zoom in (which will probably be required), you double-tap or pinch to attain your desired view. A little swipe will take your forward and back a page too. Interestingly, you can also save Web pages for offline reading, which may come in handy if you need key information on your wrist when you’re without connectivity. 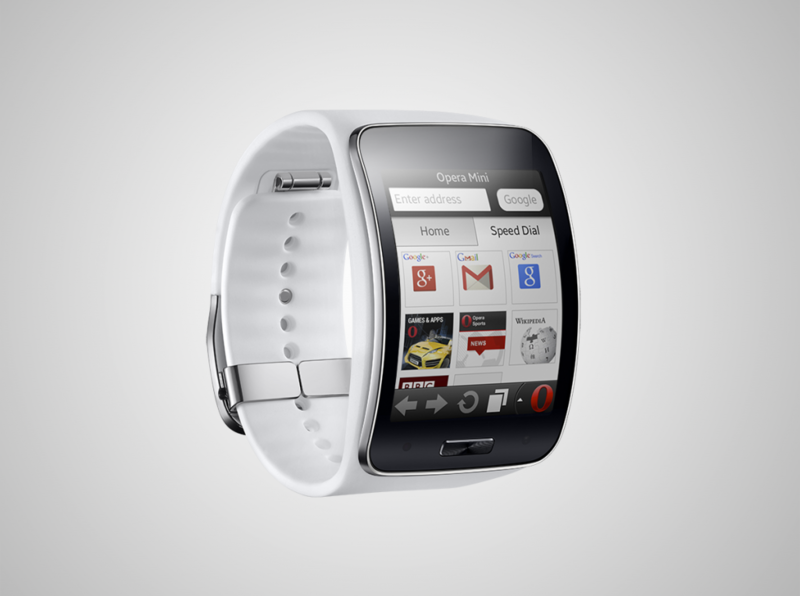 The Samsung Gear S will run Opera Mini version 7.5, when the smartwatch finally goes on sale later this month.